“Sunday November 1, 2015 was a very momentous occasion for our family. After 98 years, and thanks to the assistance of Hampstead Pals, we were finally able to be reunited with our Uncle (and for some of us – Great-Uncle) Private Robert Smith. 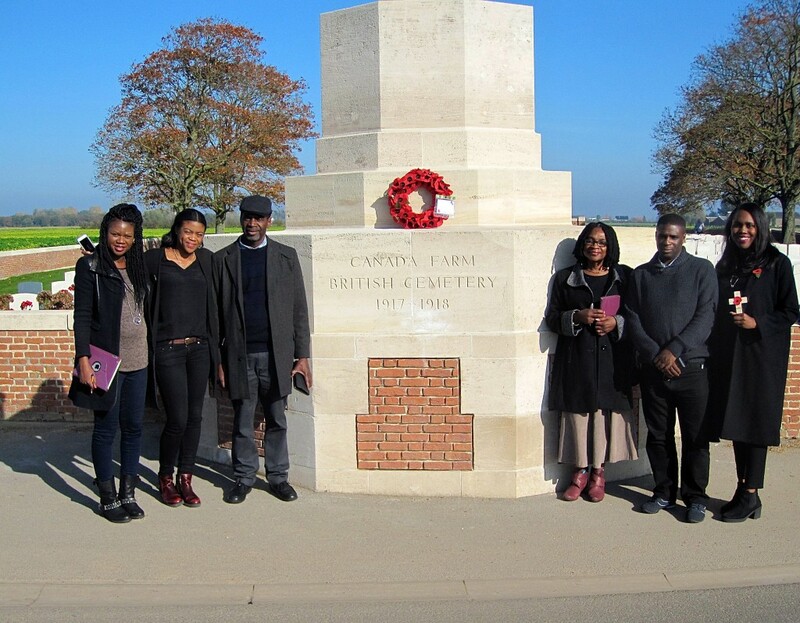 He was a First World War Jamaican soldier from the 7th Battalion of the British West Indies Regiment who was killed on 12th September 1917, age 23, in Ypres, Belgium. The experience of travelling with Hampstead Pals was absolutely fantastic from start to finish. Myself and two of my children, plus a brother and two of his daughters, were collected from my house, in South London, by Jon Nicholls and Mick How. We immediately took to their kind, warm personalities and were made to feel extremely welcome. The minibus was spacious and very comfortable. Later in the day, and to our surprise, Jon opened a hamper of food – enough for 2 days, I would say – which automatically gave us the feeling of being with friends rather than just with an excursion company We were extremely impressed and grateful that Jon took the time and effort to conduct research, which revealed further information about our Uncle’s regiment and other interesting and relevant details. These included copies of documents, such as pages from an official war diary which showed how and when Uncle Robert was killed. Following our pilgrimage to the cemetery, Jon and Mick took us into the historic town of Ypres where we had lunch, after which we visited the famous Menin Gate War Memorial. This is a huge monument inscribed with the names of about 55 thousand British and Commonwealth soldiers from the first world war, whose bodies were never recovered. We would highly recommend Hampstead Pals to others who would wish to make a journey such as ours. “Annabelle and I loved the trip. It was really great and we were so lucky with the weather. Our picnics in the sun were so nice. Thanks to all of you ‘Gentlemen’ for making our trip so good – it was truly marvellous! Love to you all. Two places for the Ypres trip please! I thought I should drop you aline of thanks for your kindness and generousity – with the champagne bottles etc! the ’50th’ was indeed a memorable tour. John Grieve and Mary Freeman were both excellent with their presentations and full marks to Willy and yourself for keeping the show on the road. The Pals really are a great group of people to get away with. Harry Carr, for me is a tonic I laugh more on a Pals trip than I do the rest of the year!